Procurement is an unceasing challenge for businesses across virtually all sectors. From supply chain breakdowns to stocking issues, the stakeholders managing this essential organizational function often find themselves putting out fires rather than developing and deploying overarching operational strategies. However, these hardships are particularly pronounced for firms orbiting the chemicals space. Here, chemicals producers and consumers grapple with significant procurement roadblocks, some of which are entirely unique to the industry. Instead of mitigating procurement issues as they materialize, these chemicals-adjacent companies must pinpoint and implement sustainable solutions that lay the foundation for success, now and in the future. It is no secret that many of the products chemicals manufacturers develop are hazardous by nature. For instance, sulfuric acid, which is perhaps the most commonly produced and used chemical compound in the world, according to researchers from the University of York in the U.K., is intensely caustic and poses a serious threat to all who handle it, including logistics teams. The ubiquitous industrial ingredient ethylene, which the American Chemical Society deemed an imperative “petrochemical building block,” is similarly dangerous and can cause considerable damage if exposed to open flames or agitated, the Centers for Disease Control and Prevention found. This variable complicates the procurement process, as producers, shippers and buyers must implement safety measures to protect workers, bystanders and the environment, lest they risk regulatory action from government agencies such as the Pipeline and Hazardous Materials Safety Administration. In most cases, this involves developing safety training programs, investing in viable chemical transportation assets and cultivating complex reporting workflows, according to Inbound Logistics. On the surface, these demands appear excessive and almost impossible to meet. This is not the case. Numerous organizations in the chemicals space manage to maintain compliant, efficient and effective procurement processes that drive growth. Most of these high-performers achieve this by ensuring supplier excellence via robust sourcing and vendor evaluation practices. This allows them to pinpoint and collaborate with only those partners that can facilitate optimal availability, while meeting regulatory and safety standards. This emphasis on partnership and supplier excellence has proven effective among businesses with top-flight procurement operations, according to analysts for the consulting form A.T. Kearny, who found that this strategy generated 27 percent of the total procurement value when deployed effectively. Competition is fierce in the global chemicals industry, which rakes in approximately $5 trillion in sales annually, researchers for Deloitte revealed. While this robust marketplace offers immense potential, it also creates significant operational issues, especially where procurement is concerned. The cost pressures and increasingly intricate organizational relationships that have arisen as a consequence of this booming environment make it difficult for suppliers distinguish themselves. And, the shortened value chains associated vertical integration and portfolio consolidation create risk for purchasers. In all, the immensely competitive state of the chemicals space has created volatility that disrupts procurement operations. That said, both chemicals suppliers and consumers have viable options for addressing such competition-related roadblocks. For those in the latter category, network optimization combined with renewed client collaboration workflows can bring down expenses and attract the attention of potential customers, all of whom prize cooperation and transparency. Businesses reliant upon raw chemical compounds must explore new supplier selection and performance tracking methods, while adding elasticity to existing vendor networks to mitigate the risks that come with managing procurement operations in an arena where mergers and acquisitions flourish and vertical integration reigns. For the better part of the last decade, businesses everywhere have been adjusting their processes to address the emergence and crystallization of globalization. Procurement stakeholders in the firms navigating the chemicals arena pursued extensive infrastructure expansions in an effort to more effectively tap global supplies and draw in international customers. Unfortunately, things appear to be moving in the opposite direction thanks to the very recent phenomenon of “deglobalization,” according to PricewaterhouseCoopers. Over the last year, countries across the world, including the U.S. and U.K., have disengaged from the global marketplace with the intention of boosting domestic growth. 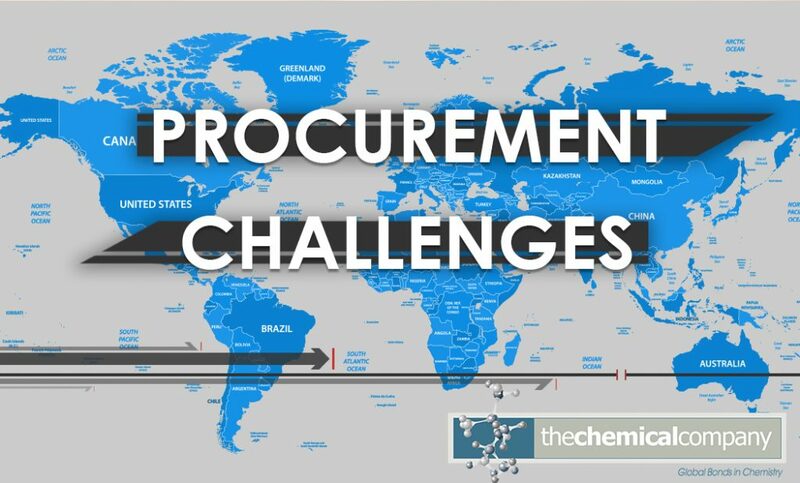 This has further complicated procurement activities in the chemicals space, as businesses that spent years rolling out worldwide supply networks now grapple with finding themselves working to mitigate the risks that materialize as this bulwark breaks down. Optimizing supply chain flexibility is really the only recourse for the organizations dealing with this particular issue. These entities must have options when it comes to procuring raw materials and finished chemical compounds, and this necessitates the cultivation of multi-layered supplier networks primed to reduce the risk of operating amidst deglobalization. Together, these issues pose a serious challenge to procurement departments tasked with sourcing chemicals and the base compounds that form their foundations. However, as discussed above, there are viable solutions for addressing these roadblocks, no matter how serious.